NEW DELHI: The Centre wants the states to explore the PPP model for their proposed metro projects and exhaust all other mass transit options before going for the metro rail. Although the new drafted policy relaxes the eligibility criteria for cities by reducing the population threshold from 20 lakh to 10 lakh, the Centre wants metros to be the last option in view of the high capital intensive nature of the project and the pressure it puts on the public exchequer. And Centre can contribute maximum 20 per cent for these projects. The metro rail network in India has seen massive growth, with 325 km in operation and more than 500 km under construction in various cities. 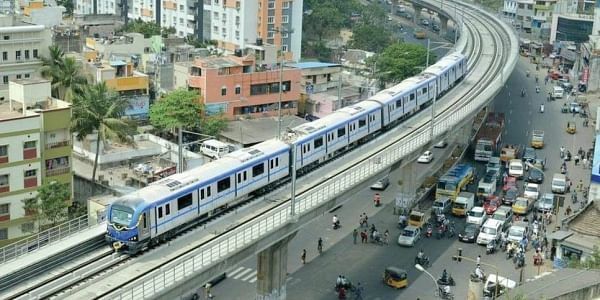 Metro projects are, at present, going on in Delhi and NCR, Lucknow, Kolkata, Chennai, Kochi, Bengaluru, Mumbai, Jaipur, Ahemedabad, Nagpur and Pune. The new policy states that the projects should be planned and executed with a longer future perspective as it is capital intensive and has limited flexibility in design changes on completion. “Cities with a linear spatial pattern may justify a metro even at lower population levels as they have fewer corridors and each would have a higher traffic density. A comparative analysis of other modes is essential for the selection. The mode that matches the demand over the project life cycle and has the least cost should be chosen,” the policy report states. “Substantial efforts such as track-gauge, civil structure and components of rolling stock have been standardised since the advent of Metro Rail Systems in India. These should be further consolidated taking in account the emerging technologies to reduce costs,” the report said. The report also points that in the recent times, more and more cities have chosen the PPP model for development and implementation of Metro Rail Projects, to leverage both public and private resources and expertise. Some of the global cities which have successfully tried out the PPP model are Bangkok, Kuala Lumpur, Manila, Buenos Aires, Rio de Janeiro, Singapore, Hong Kong, and London.The Centre wants the states to explore the PPP model for their proposed metro projects and exhaust all other mass transit options before going for the metro rail. The report also points that in the recent times, more and more cities have chosen the PPP model for development and implementation of Metro Rail Projects, to leverage both public and private resources and expertise. Some of the global cities which have successfully tried out the PPP model are Bangkok, Kuala Lumpur, Manila, Buenos Aires, Rio de Janeiro, Singapore, Hong Kong, and London.